Writing those two simple words is easy — but easy for the recipient to dismiss. In other words, Happy Birthday is not likely to make somebody feel very happy on their big day. They’ve heard those words before. Every year they hear them — from friends, relatives, neighbors, co-workers, not to mention their insurance agent, their real estate agent, their car dealer, and their fitness center. Happy birthday gets old, just like people do. You can do better with your birthday greetings. And you will do better … just follow our advice on how to make your greetings stand out. Have you shared some memorable experience with the birthday boy or girl? Then, try this: You can say, Hope your birthday’s happier than the day we … (insert your experience here, for example: the day we watched “Love Actually” three times in a row). You can even craft an original greeting by bringing up a shared experience that wasn’t so great: Something like … Now that you’re a year older, you’re wise enough not to sit down on melting blacktop and destroy your favorite pair of slacks. Do you know something the birthday person would really love? Then wish it for them. But when you wish it, exaggerate. A lot. For example, if your greeting is going to a chocaholic, you could say: On your birthday cake, I hope even the candles are chocolate — just don’t burn your tongue. 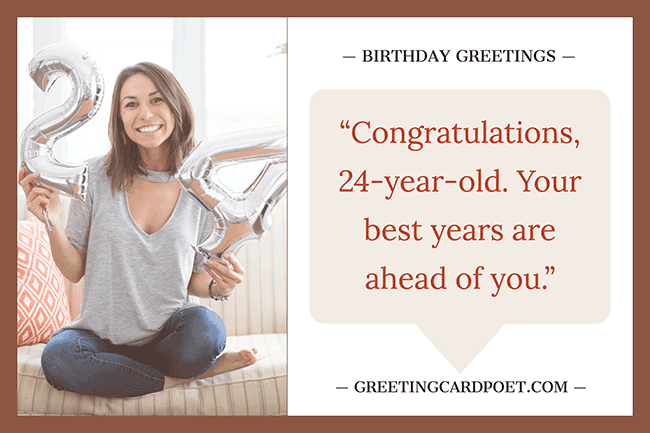 To generate ideas, professional greeting card writers use other tried-and-true sentence constructions. One of them involves completing this sentence: I was going to wish you a happy birthday, but … The end of the sentence might describe something better that you decided to do instead: I was going to wish you a happy bday … but I decided to GUARANTEE you a happy bday instead. 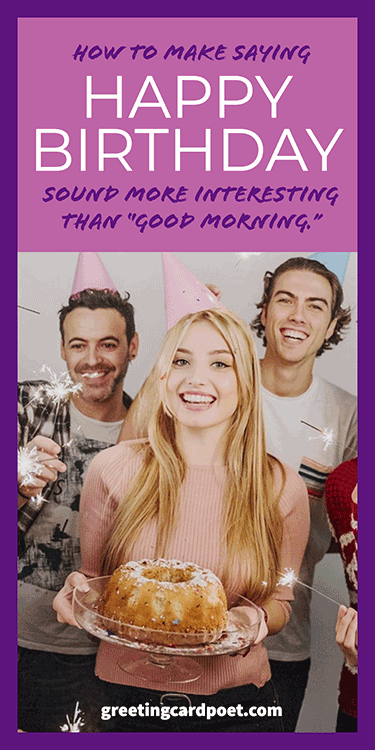 Or maybe you complete the sentence by explaining whatever it was that kept you from wishing them a happy bday: … I was going to wish you a happy bday … but I know how much you hate birthdays, so I’ll just wish you a minimally annoying birthday. Or, I was going to wish you a happy bday but … I don’t know when it is. Please let me know, and I’ll be sure to send you my best. The more the second half of the sentence surprises them, the more likely it is to make them smile. You’re probably familiar with the use of metaphor — the comparison of something to something else that’s different but similar in some key way. If someone is a very sweet person and you say, “She’s an angel,” angel is the metaphor for that sweet person. A simile is a metaphor that uses “like” or “as”: “She sings like a bird” is a simile. When you’re searching for creative birthday greetings, metaphors and similes can be — ahem, — “lifesavers” (that’s a metaphor). Here’s an example of a metaphorical birthday greeting: Birthdays can be heaven. Mornings after can be hell. And a simile: Treat your birthday like a lump of clay … make whatever you want out of it. Puns are plays on words that are less sophisticated than metaphors or misdirection, but, if they just elicit a wince, a wince is still better than the non-reaction they’ll get from the default Happy Birthday. 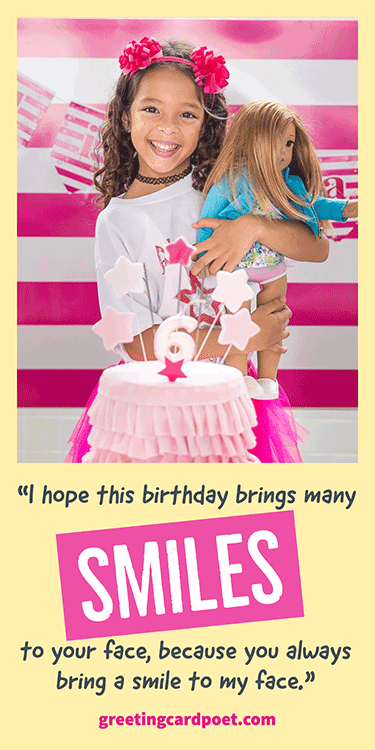 So go ahead and be punny: Don’t be bashful on your birthday — make your birthday BASH FULL. Or, Go to Starbucks tomorrow and treat yourself to a Grande Mocha Chip Frappucino. Because you deserve a Frappy Birthday. If your friend’s name is Burt, even Happy Burt Day shows a little more effort than Happy Birthday, Burt. And if you really have no shame, you can combine the corniness of a pun with the triteness of a knock-knock joke: Knock-knock. Who’s there? Bertha. The response: Bertha who? Bertha Day. Hope yours is a- happy. “It takes a long time to grow young,” wrote Pablo Picasso. Or, try a Chinese proverb, “Men grow old. Pearls grow yellow, there’s no cure for it.” Tapping into the wit and wisdom of writers and notables can be a fun way to add some interest to your greetings. Check out more Birthday Quotes. 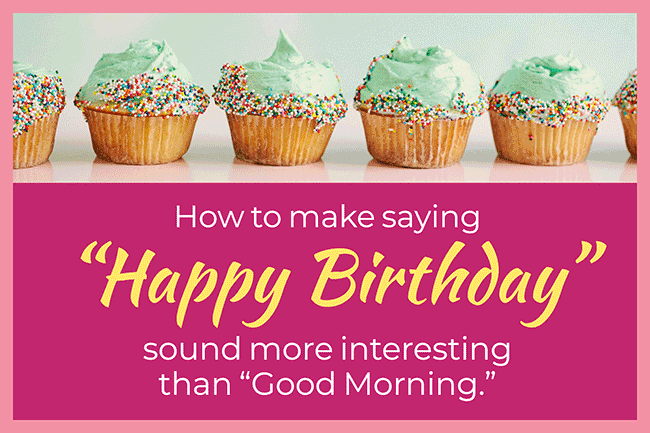 You can trigger more interesting birthday greetings by going online. Just type “interesting facts” in your search box and see what pops up. I found this one: The average American drinks about 600 sodas a year. From there, it’s not hard to get to your punch line: Congratulations on being another 600 sodas older. If your birthday celebrant happens to like music, send them a url that will take them to the appropriate YouTube video. There are a lot to choose from, but here are my top ten. When you’re having trouble getting beyond the words “Happy Bday,” you can make them more special by making it a group greeting: Happy Bday from Jeff and the whole gang; Happy Bday from My Heart, My Soul, and My Entire Being. Happy Bday from Me, Rover, and Kitty. Of course, if they’re really into cats, you could simply sign it, Me and My Me-ow. Do you know how old the person is? You might be able to use that information to make them feel good about themselves: Frances McDormand didn’t win her first Oscar until she was 39? Congratulations, 37-year-old. Your best years are ahead of you. A little research can result in some other worthwhile discoveries. Most of us are interested to know what famous historical figures and celebrities were born on our birthdays. You can find this information by visiting sites like www.onthisday.com. There you can get good ammunition for coming up with a creative greeting: Congratulations. You were born the same day as Wolfgang Amadeus Mozart. And I just know your celebration will be livelier than his! If you don’t want to be that morbid, simply base your greeting on something the famous person was famous for: You ought to fly to Paris for your birthday. It’s the same day as Charles Lindbergh’s! Or maybe you’re looking for a greeting that’s a little more racy: Just because your birthday’s the same day as Madonna’s doesn’t mean you have to celebrate like a virgin. You can also find out what happened in the news on a particular date. So if you learn that your friend was born the same day Babe Ruth hit his 60th home run, you can then encourage them to Hit it out of the park on your birthday. Another option is to study up on how they celebrate birthdays in other countries. For instance, you can inform your birthday greetee: In Sudan, children celebrate their birthday by drinking red punch called karkady, made from hibiscus flowers. But seeing as how you’re neither Sudanese nor a child, a six-pack of Bud should do the trick. Happy Bday! Is your greeting going to someone with a sweet tooth? Well, you probably don’t want to go to the trouble and expense of sending them a birthday cake. So why not give them just what they need to bake their own: A birthday cake recipe. The Internet is loaded with them. Maybe your birthday friend is especially fond of a particular city or country. Why not send them there on their big day: I’m sending you to Barcelona for your birthday. OK, not exactly. But you can send them to the website address for the chamber of commerce for Barcelona — or most any other any exotic locale. It’s the next best thing to being there. One problem with birthdays is, they come and go in a day. So, if you want to make more of an impact and show you really care, you can send your message out piecemeal. For instance, if you’re posting on Facebook, you can build suspense by posting just one word of your message every hour on the hour: (9 a.m.) I (10 a.m.) would (11 a.m.) like (12 p.m.) to (1 p.m.) wish (2 p.m.) you (3 p.m.) the (4 p.m.) very (5 p.m.) happiest (6 p.m.) of (7 p.m.) birthdays. (8 p.m.) With (9 p.m.) All (10 p.m.) My (11 p.m.) Love, (12 a.m.) Jessie. If sending hourly messages creates logistical problems for you, consider sending one message a day for a month. Everybody else will be celebrating the person’s birth day — you’ll be setting yourself apart by celebrating their birth month. 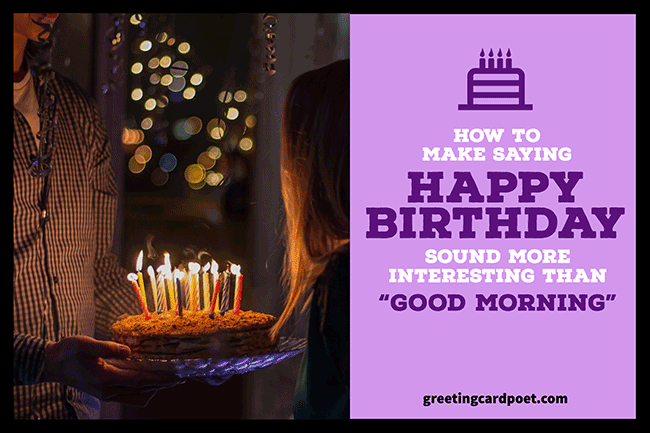 And if you can’t think of 30 different interesting birthday messages, do a little research and each day you can send them a different birthday quote from a famous person. Timing isn’t everything, but when it comes to posting birthday greetings, it can at least be something. By posting your greeting a day early, you can claim, I wanted to be the first to wish you a happy b-day. Conversely, wait until a day or two after the birthday and brag: Happy b-day, from Emily. I wanted to save the best for last. Most of the suggestions here have been on the humorous/lighthearted side. Maybe you’re thinking, “That’s all well and good, but I’d like to be a little more serious, a little more emotional.” Serious can be good, especially if you have serious, positive feelings about the person you’re writing to. If that’s the case, my best advice is to simply be honest and forthright. Tell it like it is: Jeff, I hope this birthday brings many smiles to your face, because you always bring a smile to my face.” Who wouldn’t be happy to get a message like that? By now, one thing should be crystal clear: Simply settling for the words Happy Birthday is lazy, unimaginative, and unnecessary. You have dozens of options. So get those creative juices flowing. Make a statement that stands out from the rest. Don’t settle for ordinary. And you’ll be doing your part to make sure someone has a Happy Birthday Joyful Celebration of the Day They First Saw Planet Earth.